Drag and drop in IOS 11 will make you more productive, as long as you use your iPad. On the iPhone, it's another story. It took two years for the iPhone to get one of the most basic functions of modern productivity: copy and paste. The logical next step was drag and drop, but that’s taken considerably longer to implement. Still, the day is finally here: With iOS 11, Apple has added systemwide support for dragging and dropping data all around the system—with a few major caveats. This is a feature focused on the iPad. In fact, when Apple was first building iOS drag-and-drop, it was originally destined to only be available on iPads. At some point, Apple decided that iPhone users could take advantage of drag-and-drop too, and so added support for it—but only within individual applications. So on the iPhone in iOS 11, you can drag text from out of one note in Notes, switch to a different note, and drop it in. But if you want to drag and drop across apps, you’ll need to use an iPad. With Split View, you can perform a task like dragging and dropping a URL from Safari into a document you are creating with a text editor. Here’s how it works: With images and other items, you simply tap and hold your finger on an item. If it’s draggable, you’ll see it “lift up”, as if being peeled off of a lower layer. If you’re selecting text, you’ll first need to select the text you want, then tap and hold on the selection to “lift up” that text. Once you’ve picked up an item, you can drag it anywhere. If you’re running in Split View, you can simply drag from the app on one side of the screen and drop it on the other side. It’s simple and pretty functional, and is probably just how most of us envisioned using drag-and-drop on iOS. But Apple’s implementation goes way beyond that simple Split View drag. iOS 11 really embraces multitouch in a way that previous versions didn’t. While you’re holding that selection with one finger, you can perform other operations with your other fingers. This means you could tap on an app and switch to another view, and then drop the content there. You could even swipe up and into the multitasking view, then swipe to a different app, and tap on that app to bring it forward, and then drop the data. Even better, the multitasking view is spring-loaded. When you drag a selection over an app and wait a moment, that app will zoom forward. This also works if you swipe up to reveal the Dock, then hold your selection over a particular app’s icon. That app will zoom forward, ready for your data. 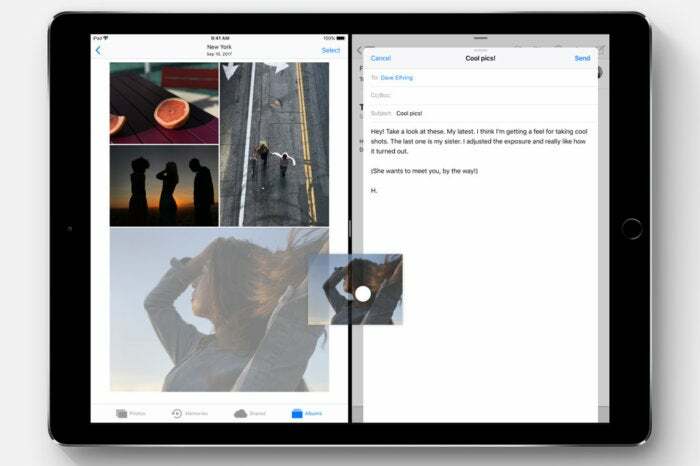 In some apps, such as Photos, you can make multiple drag-and-drop selections by “lifting up” one item and then tapping with another finger on other items to add them to the stack. You can even hand off items from one hand to another, by placing a second finger on the screen, dragging the selection over to your second finger, and then letting go with the first finger. It all feels logical and natural. Apple has done a remarkable job in implementing drag-and-drop and making it feel natural—at least, after I trained myself to unlearn many of my iOS habits and assumptions built up over 10 years of using a less capable version of the operating system. But a few areas still feel a bit strange. When I drag a selection into another app, sometimes the feedback I receive from the second app about where I’m dropping my data feels inconsistent. For example, in Notes I would often drag a block of text and expect the insertion point to be right under my finger, but it would instead appear a paragraph too high or too low. It’s a disconnect that really breaks the illusion. Your favorite apps won’t support drag-and-drop automatically—they’ll all need to be updated for iOS 11. One of the things I like about Apple’s implementation of drag-and-drop is that apps can decide for themselves what to do with different kinds of data, which allows them to do the right thing when receiving that data. An app that supports rich text can import that rich text, but one that only supports plain text will bring in the plain text instead. Drag and drop on the iPhone is limited to within the app you are using. When I dragged an image out of Photos and into a Markdown text editor I use to write stories for the web, I fully expected the app to reject the photo or import something useless like its filename. Instead, the app took the photo, copied it to the same Dropbox folder that my text file was saved in, and inserted the proper Markdown image-referencing code into my file. That’s some intelligent app design, but the end result is “it just works” simplicity that all app developers should aspire to. Given how flexible drag-and-drop is on the iPad, I’m disappointed that Apple didn’t embrace cross-app drag-and-drop on the iPhone. Sure, holding a selection while moving across full-screen apps is a bit of a handful—but it’s not much more complicated than switching between items in Notes or Mail or Safari or Photos, nor is it more complicated than dragging across a visit to the Dock or the multitasking view on the iPad. Apple should enable this powerful feature for the iPhone, too. So it took ten years, but at least it’s finally here, and it’s very good. If you’re an iPad user, you may need to take some time to unlearn your old habits and expand your mind to new possibilities. Before you know it, you’ll forget the rules of the last decade and begin dragging and dropping with abandon.